by Admin.In Accessories, Encoders, PLC's & HMI's, Position, Principals, Resolvers. Designed For The Most Extreme Conditions: DuraCoder® brand encoders are now available with stainless steel housings and an IP69K rating for operation in the most extreme conditions. 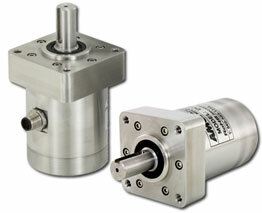 DuraCoders have a superior shaft load rating; providing a longer life cycle than other encoders. Many industrial applications require encoders that withstand a variety of harsh environments. Stainless steel DuraCoders reliably perform in applications where standard encoders fail. AMCI specializes in the design, manufacturing, and sales of heavy-duty, industrial grade rotary encoders for many different applications. DuraCoder®: Originally designed in 1993 for steel mill and earth mining equipment, AMCI’s DuraCoder® brand encoders have grown in popularity and are used in today’s most grueling applications. Considered the most durable line of rotary shaft encoders available anywhere, DuraCoder encoders are resolver-based for durability, and offered in five different output versions. Sold in an industry standard 2.5″ (63 mm) housing, DuraCoder fits most applications. Additionally, a large 4.25″ size multi-turn Analog output version is available for applications in steel mills, wastegate flood control, and any other environment subject to brutal conditions.